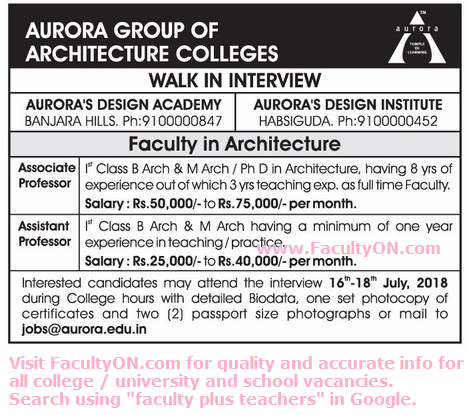 Aurora Group of Architecture Colleges, Hyderabad has advertised in the EENADU newspaper for the recruitment of Associate Professor / Assistant Professor jobs vacancies. Interested and eligible job aspirants are requested to walk-in on 16th, 17th and 18th July 2018. Check out further more details below. College Profile: From humble beginnings in the year 1989, the group has grown and has diversified into the fields of Engineering, Management, Life Sciences, Commerce and Physical Sciences Education. Aurora’s Engineering Colleges have been established with the aim to provide quality undergraduate and post graduate engineering education in the state of Andhra Pradesh. Because of this commitment and the dedication shown by the faculty and the staff, today, these colleges are frequently rated as the best engineering colleges by the magazines like India Today and Business World. How to Apply: Interested and eligible candidates are requested to attend the Walk-in interview during college hours along with CV, one set of photocopies of certificates and 02 recent PP size photo to the following walk-in address. Candidates can also mail their CV to the email address given below.